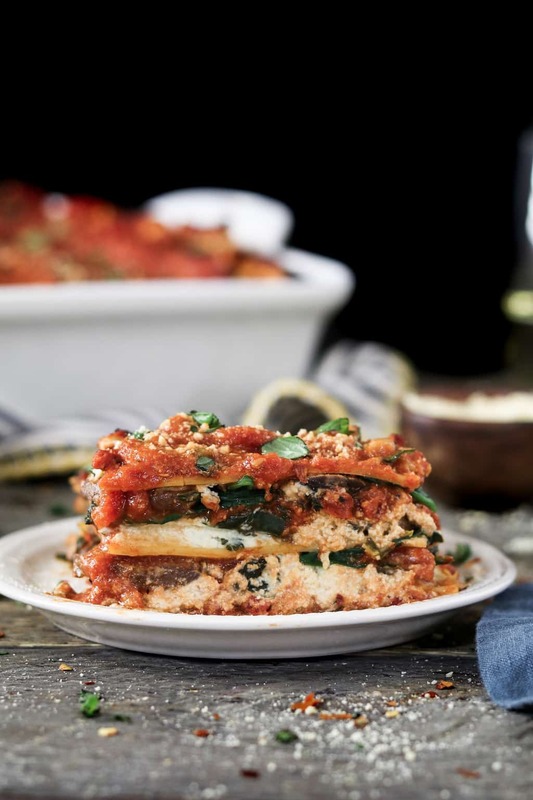 The epitome of comfort food, this Vegan Spinach Mushroom Lasagna has 4 dreamy layers of savory marinara, creamy “ricotta”, ribboned noodles & sautéed veggies. As promised, I’m back with a soul-warming meal to use with the Creamy Vegan Ricotta Cheese that I posted last week. 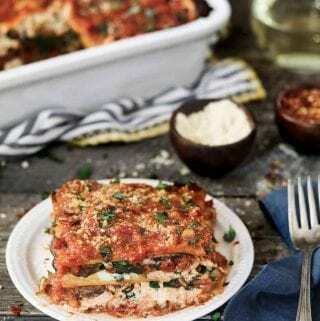 And what’s a better fit than this Spinach Mushroom Lasagna? Creamy cheese layers wrapped up with oodles of noodles? There’s just nothing better! Now tie that all together with your favorite marinara, meaty mushrooms, and vibrant spinach. It’s THE quintessential comfort food! 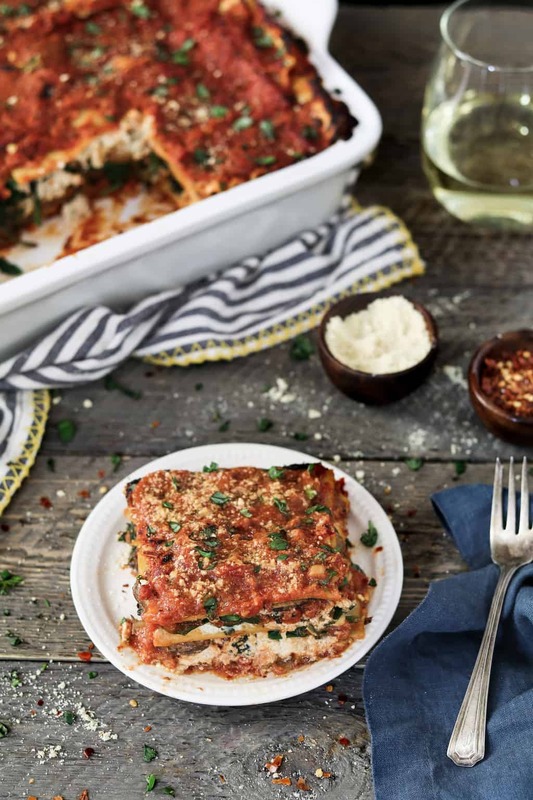 Vegan lasagna is by far, the best dish to make for a large crowd, so it’s perfect for potlucks and holiday parties. One large casserole dish can feed about 8-10 people. It’s so hearty, filling and comforting, that one piece will probably be enough. Pair it with a big family-style salad and everyone will be satisfied! 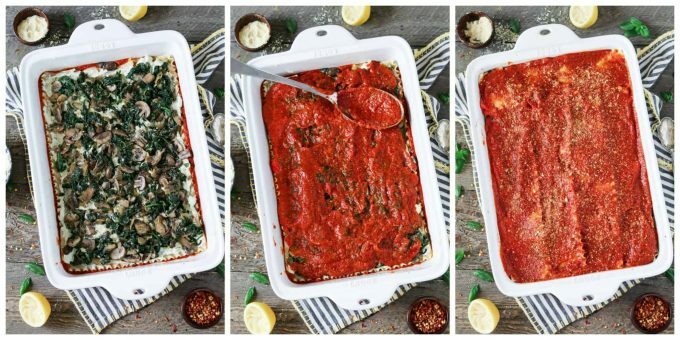 How do you assemble vegan lasagna? It can look intimidating, but it’s quite easy to put together. Just boil your noodles, prepare your filling and get your sauce ready. I used jarred sauce because it’s just so easy and still delicious. Feel free to make your own if preferred. Have everything ready in front of you before you begin. It doesn’t have to look perfect because the magic will happen in your oven. So, have fun with it! STEP 1 – To a 9×13 casserole dish, add a layer of sauce to the bottom. Spread out. STEP 2 – Add a single layer of cooked lasagna noodles (5 noodles). I like to overlap them slightly (*see photo). You will need to cut one of the noodles to fit width-wise. STEP 3 – Now add 1/2 of your vegan ricotta cheese and spread out evenly with a spatula or back of a spoon. STEP 4 – Add 1/2 of the spinach and mushroom mixture in an even layer. STEP 5 – Cover the veggies with another layer of sauce. * NOW REPEAT STEP 1-5 – Add another layer of lasagna noodles on top of the veggies. Now another layer of ricotta, veggies, sauce, and 5 remaining noodles. LAST STEP – The last layer of noodles will only have sauce on top (last photo). I like to sprinkle with vegan parmesan cheese. Feel free to leave it plain or top with store-bought or homemade vegan mozzarella cheese. Cover casserole loosely with foil and bake at 400° F for 30-40 minutes until heated throughout. Now uncover and bake for 15 minutes to make it crispy & lightly brown on top. If you want a crispier top after that, you can turn on the broiler for 2-4 minutes, but watch carefully so it doesn’t burn. Let the lasagna rest for 15 minutes before cutting. Cut with a knife and remove with a spatula. 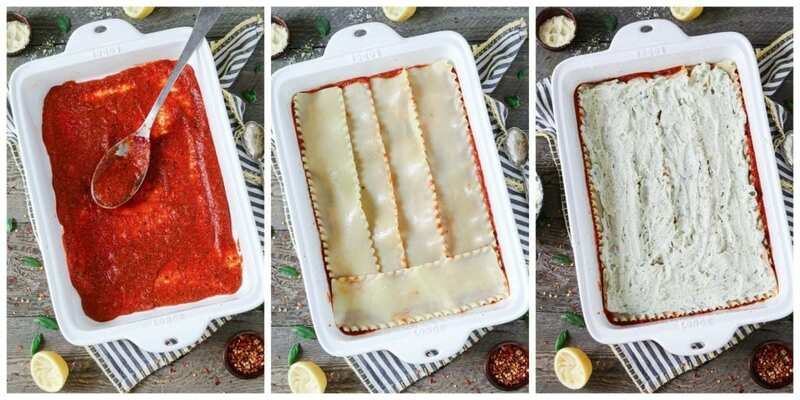 If you make this Vegan Lasagna, I’d love to hear what you think in the comment section below. It would really make my day. You can also follow me on Instagram and share your creation with me. Just tag me @veganhuggs and hashtag #veganhuggs so I don’t miss it. 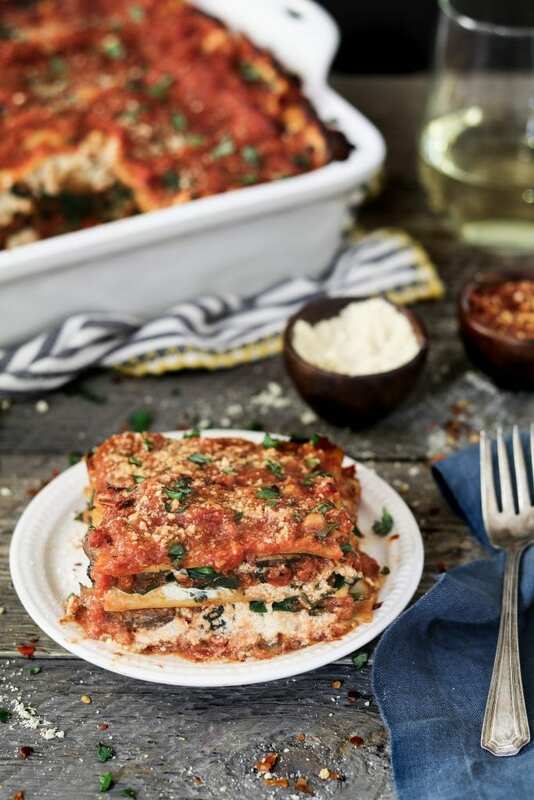 The epitome of comfort food, this Vegan Spinach Mushroom Lasagna has 4 dreamy layers of savory marinara, creamy "ricotta", ribboned noodles & sautéed veggies. To a large pot of salted boiling water, add your lasagna noodles. Cook until al dente and according to package directions (usually about 7 minutes). Drain and rinse with cool water (to prevent cooking). Drizzle with oil to prevent sticking (gently toss to coat). Add garlic, parsley, and oregano. Sauté for 1 minute. Add mushrooms and cook until they have released their liquid, reduced their size and are somewhat browned (the pan should be almost dry) About 7-9 minutes. Now add the spinach. You want to cook it until the liquid is released and cooked off. The spinach will reduce in size quite a bit too. About 5-6 minutes. Remove from heat. Sprinkle with salt & pepper. Taste for additional seasoning and add as needed. To a 9x13 casserole dish, add a layer of sauce to the bottom. Spread out. Add a single layer of cooked lasagna noodles (5 noodles). I like to overlap them slightly (*see photo). You will need to cut one of the noodles to fit width-wise. Now add 1/2 of your vegan ricotta cheese and spread out evenly with a spatula or back of a spoon. Add 1/2 of the spinach and mushroom mixture in an even layer. Cover the veggies with another layer of sauce. Add another layer of 5 lasagna noodles. Repeat every step once more. The last layer of noodles will only have a sauce on top. I like to sprinkle with vegan parmesan cheese. Feel free to leave it plain or top with homemade vegan mozzarella cheese (or store-bought). Cover loosely with foil and bake for 30-40 minutes, until heated throughout. Now uncover and bake for 15 minutes to make it crispy & lightly brown on top. * After that, if you want a crispier top, you can turn on the broiler for 2-4 minutes. *Watch carefully so it doesn't burn. Let the lasagna rest for 15 minutes before cutting. Cut with a knife and remove with a spatula. Enjoy! * You'll only need 15 lasagna noodles, but I make the whole box in case some break apart. * Some jarred sauce can be watery which could make your lasagna watery. To thicken it up add 2-3 tablespoons of nutritional yeast to it and heat it on medium heat for 2-3 minutes. *You can also use cornstarch to thicken instead. Make a slurry with 1 tablespoon of cornstarch and 1 tablespoon water. Mix them together and add to simmering sauce. Whisk well and let cook for 2-3 minutes. * Taste jarred marina for salt. Add more if needed. * I like my lasagna saucy so I add it generously. Feel free to use less. * Nutritional info includes vegan ricotta cheese. This sounds great! Can you recommend another kind of sauce; I can’t do tomatoes? I was just telling my husband a vegan lasagna would be the perfect star of the show for our Christmas dinner when we host family this year! Yours looks SO dreamy, from that ricotta to all the veggies and the beautiful sauce. 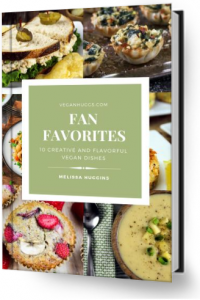 You’ve definitely perfected vegan lasagna, it looks great, Melissa!